An exclusive new item, the multi-color illuminated LED message board is used for highlighting important and fun messages at your business or home. Everyone appreciates a hand-written message, whether it is to tell customers about today's happy hour drink specials or just a note to yourself about a hot date Friday night. 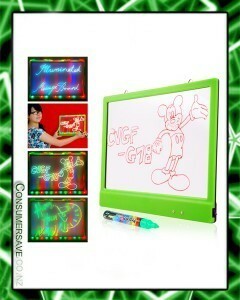 Well, here is a perfect sized dry-erase message board that not only helps you get your message across, but does it in true style - with multiple colored LED lighting effects! Who exactly can benefit from a board like this? For the restaurant or store owner, now you can advertise your specials and be assured that your message gets extra attention from your customers (even in a crowd). For college students, use it during the day to write a reminder notes to yourself, then use it at night advertise your plans to your friends (and keep them from interrupting your "study time"). An exclusive new item, the multi-color illuminated LED message board is used for highlighting important and fun messages at your business or home. Everyone appreciates a hand-written message, whether it is to tell customers about today's happy hour drink specials or just a note to yourself about a hot date Friday night. Well, here is a perfect sized dry-erase message board that not only helps you get your message across, but does it in true style - with multiple colored LED lighting effects! Who exactly can benefit from a board like this? For the restaurant or store owner, now you can advertise your specials and be assured that your message gets extra attention from your customers (even in a crowd). For college students, use it during the day to write a reminder notes to yourself, then use it at night advertise your plans to your friends (and keep them from interrupting your "study time").